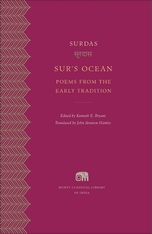 An expanded and revised edition of Surdas: Poet, Singer, Saint (1984) will be published by Primus Books in 2017. It includes a new hundred-page chapter entitled “An Afterlife in Art,” which focuses on the veritable explosion of illustrations of Surdas and his poetry that happened in Udaipur in the latter half of the seventeenth century and on into the eighteenth. Sūrdās bows before Krishna. Detail from an illustration of milat hī pāyan dhariyo pātī, circa 1725, courtesy of the Government Museum, Udaipur. Also, a Hindi translation of Three Bhakti Voices (2005), by Ashok Kumar, is scheduled to be published by Rajkamal Prakashan in late 2017 or earlier 2018. Now available in paperback from Harvard University Press in South Asia for Rs. 599/-. A Storm of Songs received the Ananda Kentish Coomaraswamy Book Prize from the Association for Asian Studies on March 17, 2017: https://barnard.edu/news/prof-john-hawley-awarded-2017-ananda-kentish-coomaraswamy-book-prize. 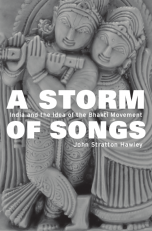 On the same day, since Jack Hawley was in Delhi, the Centre for the Study of Developing Societies organized a seminar in which members of its faculty discussed the book: http://www.csds.in/events/storm-songs-india-and-idea-bhakti-movement. Following a lecture at the CSDS in 2015, Hawley was interviewed by Anuradha Raman of The Hindu: http://www.thehindu.com/opinion/%E2%80%98Bhakti-challenges-communal-religion%E2%80%99/article13990462.ece. Songs of the Saints of India has gone into its twelfth printing (OUP). Three Bhakti Voices is now available in paperback from Oxford University Press.